This past weekend I had some eggplants/aubergines sitting here waiting to be used. I thought about Pasta alla Norma, Calabrian stuffed eggplant, or eggplant balls, but decided that I really wanted some zuppa to warm me up–we had quite a chilly, windy weekend–so I went to the Interwebs to find something new. I found this recipe for Mediterranean Eggplant Soup from Vegetarian Soups for All Seasons: Bountiful Vegan Soups and Stews for Every Time of Year by Nava Atlas. It looked fabulous, so I gave it a try, making my own adjustments, including substituting the “Italian herb mix” with a few sprigs of rosemary and thyme (and of course peperoncino) and adding a vegetable bouillon cube at the last minute for a little kick. I also sprinkled some grated cheese on at the end because, well, I do that with pretty much every soup I eat. I didn’t, however, add the small soup pasta that is called for because I really wanted to keep it light *and* I wasn’t in the mood for pasta (I know, call the authorities!). When I make this again, I’ll add even more vegetables and make it a more general Mediterranean vegetable soup–peas, green beans, zucchini, perhaps even some cannellini beans for texture. Another idea is to throw in some shrimp and maybe a dash of Old Bay seasoning. As you can tell, I think this is a great base for tomato vegetable soup, and all the better if you have your own stock ready. And *so* easy. Be creative! 1. Heat oil in a soup pot. Add onion, garlic, and celery and sauté over medium heat for a few minutes until onion is translucent. 2. 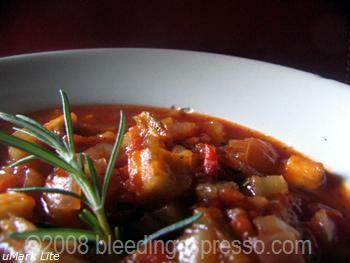 Add water, bouillon cube, eggplant, tomatoes, rosemary, thyme, and peperoncino. 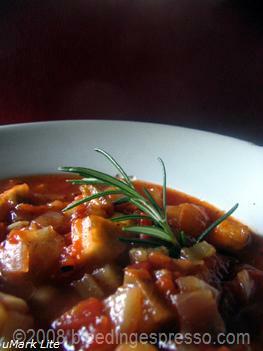 Bring to a simmer and let cook until eggplant is tender, about 45 minutes. 3. Add parsley, and adjust the consistency to your liking. Season to taste with salt. 4. Grate some of your favorite cheese on top if you like, and serve immediately. pamper moi. It should freeze ok don’t you think? Mmmmm… yum. I feel like I can smell this simmering on the cooktop, and it smells delicious. Good thing both my carnivores will be out of the house tonight! Sounds good. I would consider adding some chick peas for some protein and additional flavour. I am not a huge fan of eggplant, but I know that Chris would love this soup. Think I’ll be a good girl and give it try for him 😉 I like the idea of some ceci too!!! My Melange’s last blog post..US Airlines in Trouble? veggies to rot and this week I have a couple of eggplants in the fridge waiting to meet their maker. a kinda sorta diet, I had to nix that idea. So the soup recipe is poifect! Thanks!!! Linda’s last blog post..Picture it! The Calabrese in me threw his head back and howled, the Abruzzese reached for the wineglass, the German shook his head in dismay and the Irishman pounded a stake through the heart of the Calabrese. I am large, I contain multitudes. Kind of like an insane asylum. In any case, yes – this is a good dish for windy, chilly afternoons, which we’re still having along the coast here. I love the simplicity of it – this may be one I actually try! Mwaahahhaahahaaa! I knew I’d get you cooking on Wednesdays sooner or later! Yet another birthday present for you. You are truly viziato. Also? The other day I learned the word “manicomio.” It’s become a fast favorite. I’m allergic to eggplant but we have these beautiful green zucche in Buenos Aires that I think would work really well as a substitute. I’m going to try it soon! I could go for a bowl of that right now. It’s a little cool and rainy here today. I have some in the freezer I could defrost for you Shan! I’m a huge fan of eggplant and this sounds wonderful! I also loved your eggplant balls, they’re on my “to make” list for sure!! You say eggplant, I say aubergine, eggplant, aubergine,eggplant, whatever! This sounds delicious, I like ‘one veg’ soups so that you really get the flavour but I think if I were making this I might add a little pancetta to the mix. Don’t tell the vegans, Amanda, but that’s *exactly* what I was thinking too. I wanted to keep the recipe vegetarian, though, for the sake of the blog I went without pancetta. Next time though…. mmmmm, this looks so delish and comforting too! I think tomato-based soups always provide the best comfort 🙂 Thanks for stopping by! It looked delicious! Will definitely try the recipe soon. I might add the pasta. Nothing is real food for us (Chinese) without any complex carbohydrate right? Thanks so much for this recipe Michelle! I never thought to make a soup from eggplants. It is such a verstile vegetable! I blogged about my favorite Italian cookbooks today. I hope if you have a free moment you’ll tell me what yours are. Pat’s last blog post..My favorite Cookbooks…and Yours? I have one thing to Say : YUMMY! SabineM’s last blog post..Sure is hot down here…. I’ve been thinking about getting this book too Sabine; it looks fabulous! Mmmm and I love toasted ciabatta with just about anything 😉 Thanks for coming by Daniela! I love eggplant. I could eat it every day of the week. Never made an eggplant soup, thank you for the recipe. This is the first time I ever had it soup as well Merisi; hope you enjoy it! A whole cookbook full of vegetarian soups? Oh, honey, I am SO THERE. Doesn’t it sound awesome? I’m not even vegetarian or vegan, and I wouldn’t mind a copy. That soup looks tasty. I like topping soup with cheese as well. I posted before, but the comment never appeared… well… I came by to tell you that I made this recipe, and it was a hit with the family. I LOVE eggplant, my boys like it. This was really good, but I think next time I will add some small pasta. Thanks for sharing. Beatriz’s last blog post..Tag you are it! I made this last night with the addition of a can of cannelli beans and a boat load of basil. Served with whole wheat cibatta bread. It came out great, and will definitely stay in rotation at our house. Thanks so much for sharing.